The standard units of currency are the copper penny (or cp) and the silver penny (or sp). 12 copper pennies = 1 silver penny. 50 pennies of either sort weigh 1 pound. 350 pennies are equivalent to one "bulk unit" for the purpose of encumbrance (see below). The make of every item reflects its origins. Unless specifically stated (and priced) otherwise, all goods are assumed to be the works of Men. Elvish works are a rarity. These are typically light, curvy and sinuous, and feature plant and animal motifs. Assume that Elvish goods cost 20 times the marked price expect as noted below. 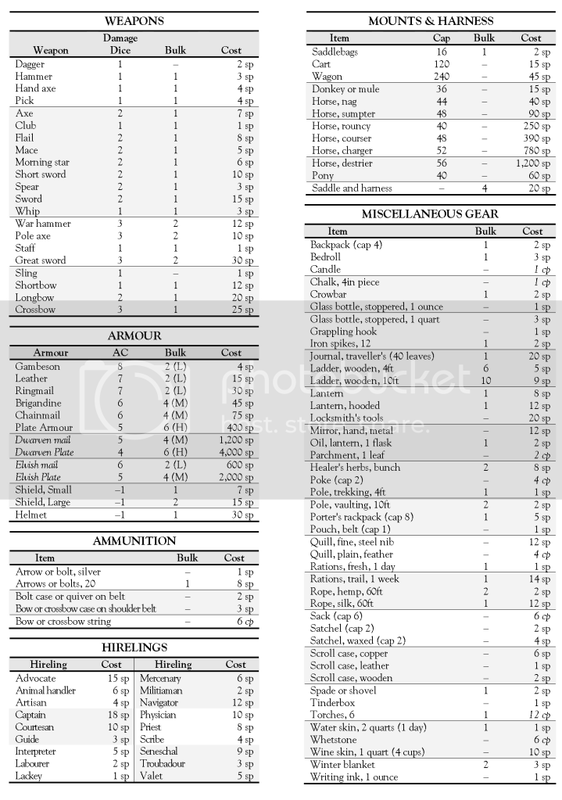 Elves and Half-Elves, however, may have goods of Elvish make for only 5 times the listed price (or Elvish armour for one quarter the listed cost). Dwarfish works are also scarce. They are typically solid metal, angular and of indomitable durability. They feature mountain, hammer and anvil motifs. Assume that Dwarfish goods cost 10 times the marked price expect as noted below. Dwarves, however, may have goods of Dwarfish make for only 5 times the listed price (or Dwarfish armour for one quarter the listed cost).